You can see the old and the new during this great overview of Québec City, and make use of the onboard Wi-Fi to look up popular eateries or shops last-minute. If you find something you like, just hop off at one of the stops! 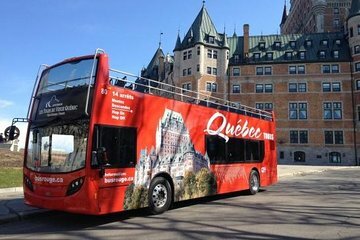 Get to know Quebec City and its top attractions on this entertaining and educational hop-on hop-off bus tour. It all begins with a hop on at any of the 12 stops. Board one of the red, London-style double-decker buses and enjoy the view. Hear interesting facts and stories through audio ear phones, available in 10 languages. Learn about the past, present and future of Quebec City, a UNESCO World Heritage site, as the bus rolls along from one location to the next. 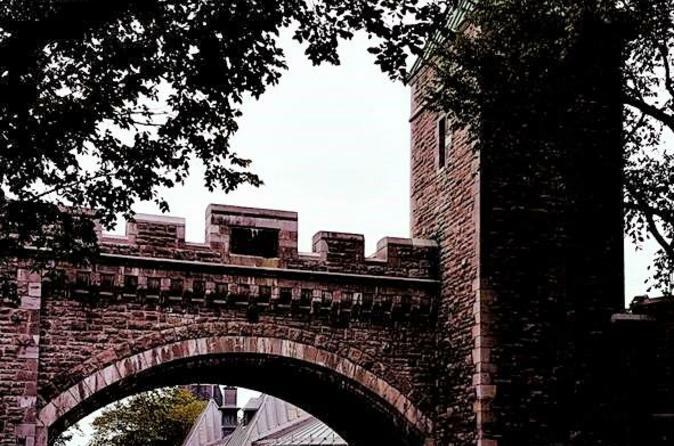 Hop off at any of the attractions for a closer look, then hop back on when it’s convenient, anytime between 9:30 a.m. and 4 p.m.
Visit popular sites like Old Québec, Fortifications of Québec, Quartier Petit Champlain, Place Royale, Vieux-Port de Québec, Citadelle of Quebec, Notre-Dame-des-Victoires Church and much more. It truly is a fun and fast way to get to know Quebec City and the many amazing attractions it offers. A sightseeing tour of Quebec City has never been easier — or more fun — than this hop-on hop-off tour. Experience Quebec City in this unique way. Two hour tour was very good but busy times can mean a long wait. 60 min wait plus 2 hour tour did not allow us to use the hop on/off feature. It was worth it though to see all of the tourist areas for an overview. Buses clean, employees nice/efficient, and tour very complete. Just bad luck to hit the busiest weekend time. We did see empty buses as our vacation progressed and recommend M to F use if possible. This is a great way to get an overview of Quebec especially if you have a short amount of time. The audio system worked well. We love being able to hop on and off at different attractions.. Enjoyed the introduction to Old Quebec. Convenient 30 minutes between buses which allows us to visit more of the sites. We enjoyed the tour. Very easy to get in and off. We did the entire loop first then chose what we wanted to see more of. Only negative comment would be that we didn’t know that even though we got our tickets online you still had to go to the visitors center to get your bracelets to get on and off the bus. Was not happy to wait in line. This was an incredible way to be inteoduced to the wonderful and charming sites of Quebec City with its magical rooflines. Easy to use, easy to find, stops at great points of interest, narration is informative and good. The music between narrations could be left off. My husband and I were visiting Quebec City for the first time. We have a tradition, on our second day we're going on the Hop-On Hop-Off bus tour. Tour was very good, gave us lot's of history, and we got a great sense of the city. We had one problem getting on the bus with the e-voucher. The driver said that we should have a printed version of the voucher because it will help him to get paid. After i explained to him that e-voucher was offered through Viator he wrote down the confirmation number and my name, and let us board the bus but told us not to leave the bus because with this e-voucher we won't be able to board the bus again. Other then this confusion, we had a good time! !